is, as the name implies, of the type deriving its name from the peculiar backward slope of its main planes. When viewed from in front the upper plane is straight, whilst the lower one possesses in addition to its backward slope, a comparatively great dihedral angle. The fuselage, which is of rectangular section, tapers toward both ends, the streamline form being further improved by a turtle back in which openings have been cut out for the engine and occupants. The seats are placed very far apart, the pilot's being placed nearly halfway along the fuselage, whilst that of the passenger is situated immediately behind the engine. Either a 100 h.p. Mercedes or a 150 h.p. Argus motor may be fitted. With the former the speed of the machine is about 60 and with the latter 68 m.p.h. The chassis is of a type which has attained great popularity in Germany and consists of two pairs of steel tube struts, each pair of which forms a V as seen from the side. A single tubular axle sprung by rubber shock absorbers and carrying the two disc wheels rests in the angle between the front and rear struts. No skids are incorporated in the chassis, but a small tail skid takes the weight of the tail planes when the machine is at rest. 1. 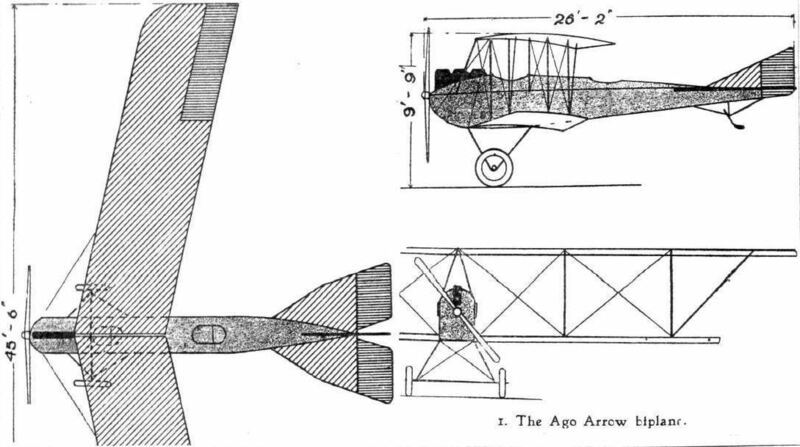 The Ago Arrow biplane.